If you want to experience the quaint village lifestyle, this home is for you. 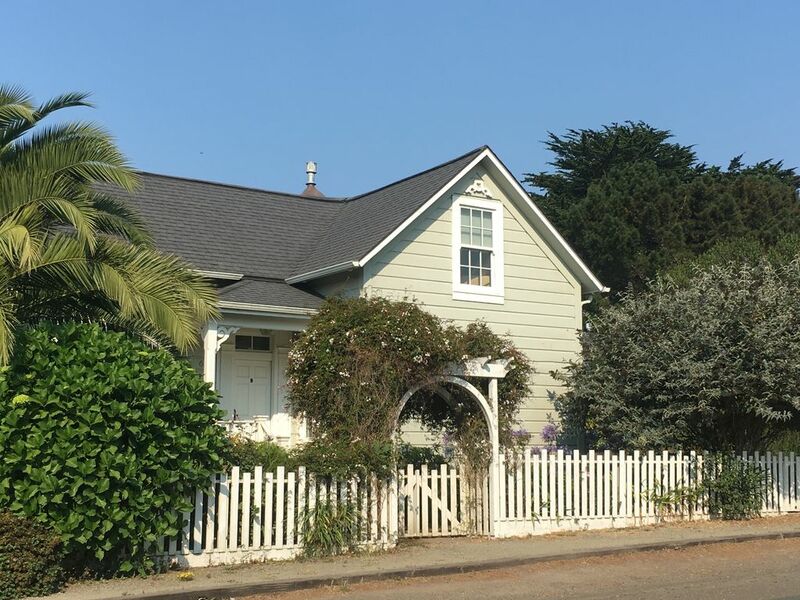 Situated in the quiet residential village of Mendocino, it's a short walk to all restaurants, grocery stores, art galleries, fine shopping, beaches, walking trails and headlands. This home has a beautiful private garden and is just steps away from spectacular ocean views. A photographer's paradise, more than 40 films and television shows have been filmed in Mendocino. The charming Victorian-style homes, water towers and dramatic ocean views make it an ideal spot for rest, relaxation, creative work and exploring nature. This home is a real gem, with cozy beds and all the amenities you'll need to rest and relax. What people often don't realize is that October, is one of the most favorable times to visit. While all seasons offer something, October is my favorite month for the warmth of the weather, the slow down of the season (re:less crowds) and the sun that shines warm before the storms of winter. * Marigold House can also be rented in combination with Marigold Cottage (VRBO # 1164708), a studio unit with its own kitchen, on the same property, in order to accommodate up to 6 guests total. *I will greet you at the house to answer any questions, help you with info about the area and let you in. Our family have been residents of Mendocino since 1994. We love the village and its quant uniqueness. You can walk everywhere and to the ocean is right out your doors. Mendocino is special with its three borders of ocean. Headlands hiking and spectacular ocean vistas. I made it a goal to move here almost thirty years ago. We love the village setting the most for vacationing. The slower, quiet pace of Mendocino along with the fresh ocean air and the sounds of the ocean waves at night, seem to be the perfect "soul food" for us. This particular house was moved to where it sits on May 14,1870 making it one of the oldest homes in town. We purchased the home in 2005 and did a complete renovation / remodel of the home and property. It is a charming Cottage Style Victorian home and by giving it the restoration it deserved, we felt we were contributing to the community and town that we loved. Having enjoyed it as our own private vacation home, we are now ready to share it with others who will appreciate its unique charm. This particular home is on a double lot and has two private decks both behind the main house and out in the garden. Because the house is a block or two inland from the headlands, it is shielded from the cooler ocean breezes which provides more available days to BBQ and sit outside in the garden. We love the charming village lifestyle and this home provides all the amenities with privacy and access to everything we need while there. It is on the village. Convenient to all. The gardens are peaceful and the space serene. It is bright and comfortable and private too! Big River Beach is walking distance on the edge of town. There are many coastal bluffs and areas close by to explore. Mendocino is on the coast, and has many fine restaurants, shops, galleries, grocery shopping and the Big River Beach all within a short walk. Many Festivals happen in this picturesque town year round. Unfortunately there are stairs to enter the home and front porch and back door stairs as well. In addition, it has upstairs bedrooms. This home is not wheelchair friendly. We heartily recommend this wonderful property. Great location, quiet, quaint, clean, spacious, cozy. And Zelda and Steven are great communications, helping out with anything we need in a timely and friendly way. This home welcomes you to fresh air inside and out. You are a short walk from the main grocery, as well as the coast. Really, a short walk from anything in Mendocino town. The home was incredibly clean and free of wear and tear, especially as a rental property. Both bathrooms were ample size, as were the beds and bedrooms. As a family of three, we each had a separate room (besides the bedrooms) to escape to in the morning or late evening to read, enjoy your coffee or tea etc. after spending a long day together. In the evening, walk out the front door and look right and you'll see the fantastic Mendocino sun coming down, coloring the sky. At night, head to the garden, look up and see the Milky Way with your naked eye. We had no issues parking our high-end vehicle right in front, just steps from the front door along the white picket fence for easy loading and unloading. We'd recommend this home to family and friends, and return during our next magical Mendocino escape. The place was a perfect distance for walking to anything in the village or along the coast. We would return in a heartbeat! The house was perfect. Spotlessly clean, comfortable, light and airy, and stocked with everything ! In addition to the above, everyone was so responsive and helpful. This was a perfect mini vacation. Perfect location. Very nice comfortable house with lots of space. Upstairs shower is very nice. Downstairs just has a claw foot tub. Kitchen is lovely and well-equipped. This would a great place to stay for a month. Great place; great location. Walk to everything. Third time here. That says everything. Will return again when possible. Lovely place in a perfect setting. The house is close to the Mendocino Art Center, (The MAC): the heart of the spirit of Mendocino, founded in 1959, it offers 150 retreat style classes each year in ceramics, fine arts, fiber arts, jewelry and sculpture. Right outside your doors, you can walk to the ocean in minutes. You'll be walking into town in the same time frame. You can hike, eat, bike, tour wineries, ride the Skunk Train, visit art galleries (besides the MAC), dine, cruise on kayaks, lunch, walk the oceanfront headlands that surround Mendocino on three sides and have a gourmet dinner. (Great restaurants by the way). The Mendocino Botanical Gardens is 7 miles north, ranked #5 in the country by USA Magazine, it is the most visited spot on the coast, with trails reaching ocean front.